So I’m glad to say I’ve been accepted to the Danish Swedish Farmdog Club of America! The people are really nice and helpful. I hope I can show Jet in conformation. Apparently the only club that does DSF conformation is ARBA.. the American Rare Breed Association. From their calendar, I’ve seen some shows listed in California and Colorado. I can do those… the drives would be long, but maybe I can fly. I really want Jet to be comfortable flying. Especially since it’s my hope to take him back to Sweden in a couple of years to show him in conformation there, and to meet his breeder and all his relatives! I am hoping he will be a good kong chewer. I’ve been giving him kongs when I go off to work in the mornings so he has to work at getting the treats out. He still gets his regular food in a bowl, he’s young and he needs good nutrition for sure. He does like that freeze dried liver in the kong toys too. And I’m sure as he gets older he’ll get better at getting it out. Once in a while he’ll chew on the corner of a pillow or something, but I trade him the pillow for a yummy bone and he is much happier. It’s so wonderful having a puppy… a well bred well behaved well socialized puppy for a change! Every day I’m impressed at what a good boy he is. 🙂 He’s even learning to sit before I pick him up. I’m not going to start jump training or anything like that, any time soon. I might make some hoops, though, to get him going through hoops. Or just maybe the jump uprights too, so he’ll be loving agility by the time we can start the real fun training! Sounds like conformation could be a fun adventure too, although the breed ring has never really been a place that I’ve even felt overly drawn to. LOL Maybe I can just be your cheering section. Thanks for your kind words, we have tried to prepare Jet and present him to any situation, for the trip over, and also the various different mental challenges he would come to face in his new invironment. It seems that this efforts has payed back, we are so happy that you are satisfied with him. But, you know – we do think that he couldn’t have had a better family to live in than yours! You are SO welcome both to our home the day you’ll decide to make the trip over and show Jet in Sweden and in Denmark. We are looking forward to that day! 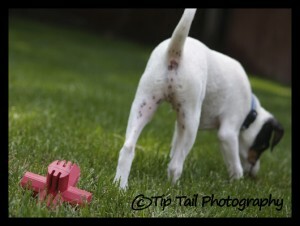 .-= MMDogTraining101´s last blog ..Training Your Dog to Search =-. Tatum is such a pretty girl! Jet is a cutie too! Why do you think Tatum will never be completely housetrained? Just curious cos I have the same problem with my border collie/lab mix. If the ground outside is wet, she will not go outside. I’ll find her “presents” hidden in the house instead. .-= Cathy´s last blog ..Pirate Dog Costume =-. I don’t think Tatum will ever be 100% house trained. She came from a hoarder and lived in her feces for a long time. But that’s okay, we have tile and so we manage. We are so glad we tore up the carpet! Previous Previous post: What’s Tatum Up To?